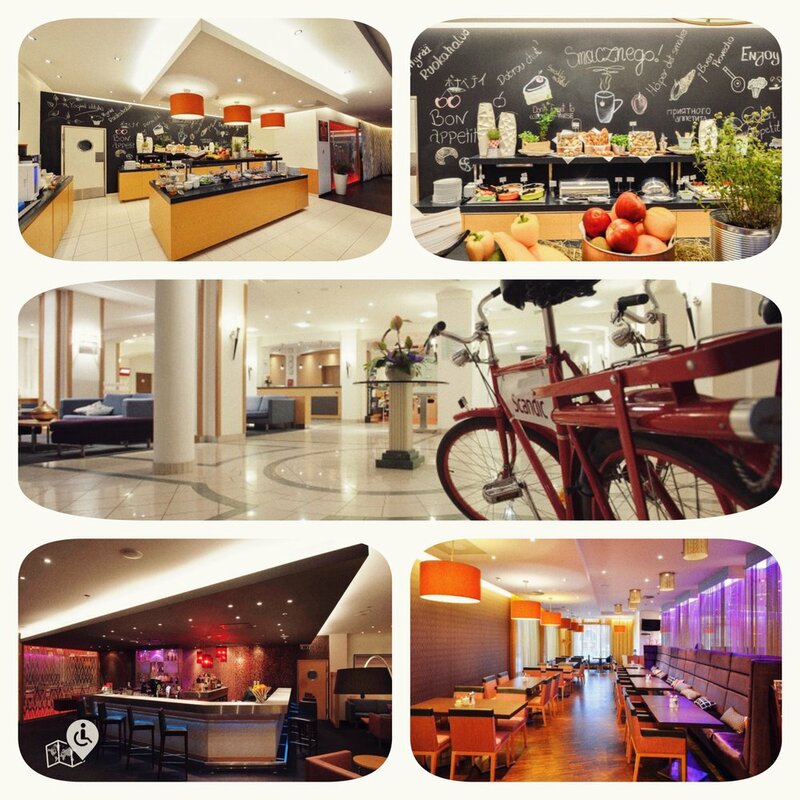 Scandic Gdansk is an excellent wheelchair friendly hotel with a great location, just opposite the train station and within a rolling distance from Old town. Ideal to explore the whole town on wheels. Apart from being located right opposite the main train station, it also has a regulated taxi service and bus stop right in front of the hotel, which takes you to the airport in just 20 minutes. The hotel entrance is fully accessible with no steps or curbs and a long ramp and automatic doors. The breakfast buffet was absolutely great with plenty of choices for meat eaters and vegetarian alike, it also has an appropriate height for us wheelchairs users so we can independently take whatever we want. In Scandic’s lobby bar you can order light dishes and desserts, as well as drinks with and without alcohol. Senso Restaurant & Bar is ideal for socializing. Snacks and Mediterranean dishes are served here, and you can choose from a variety of wines. Several tea and coffee varieties are also offered and the tables has an appropiated height for you to accomodate your wheelchair. The bar/restaurant staff were very attentive and breakfast personal always asked me if I needed assistance. Actually, all members of the staff seem to be well trained to deal with customers that use a wheelchair, the service provided was second to none. Everyone there made sure that my stay was pleasant and comfortable. Lovely folks. The room was spacious enough for a manual wheelchair to get around and it had a very comfortable bed, tea and coffee facilities, a mini bar, TV, lots of storage space, a safe, an iron and ironing board, hairdryer, and soap and shampoo and even welcome snacks. Bathroom was also fully accessible with hand-bars, roll in shower and sink and they also provided me with a 'shower chair', that did a very good job in the end. Everything was very well organised and clean. I strongly recommend this hotel for its great location, accessibility, and excellent customer service. Podwale Grodzkie 9, 80-895 Gdańsk, Poland.